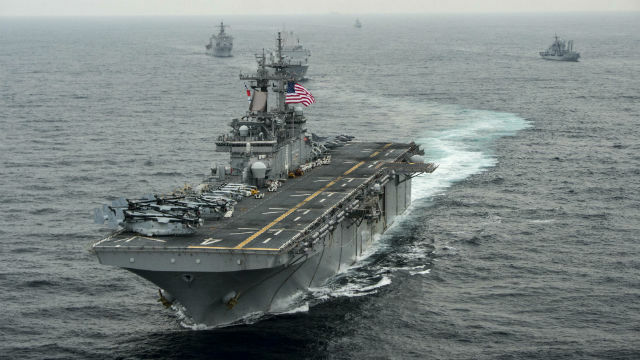 The ships of the San Diego-based Boxer Amphibious Ready Group and 3,000 embarked Marines entered the 7th Fleet area of operations on Saturday after nearly four months fighting ISIS. While participating in Operation Inherent Resolve, Marine pilots flying AV-8B Harrier II jets conducted airstrikes against ISIS in Iraq and Syria. Now the nearly 4,500 sailors and Marines of Boxer group and Camp Pendleton-based 13th Marine Expeditionary Unit will conduct exercises and port visits to enhance maritime partnerships and promote stability in the Indo-Asia-Pacific region. The Boxer group is comprised of the amphibious assault ship USS Boxer, amphibious transport dock ship USS New Orleans and amphibious dock landing ship USS Harpers Ferry. The 7th Fleet area of responsibility includes more than 48 million square miles of the Pacific Ocean, running from the international dateline to the eastern coast of Africa, and from the Antarctic to the Kuril Islands, Northeast of Japan. It contains more than half of the world’s population.